My art is temperamental; a medley of picture and word which compliment as well as complicate. It is an art which reflects the different personas adopted, based upon the most minuscule circumstance. Words expand this longing to be understood, to project the otherwise inexpressible thought as if captured in a singlular glimpse of mind. Therefore my writings reflect a moment, a vision, a perception; whether mine or the expressed aptitude of anothers’ attitude. There are times when articulation, for me, is translucent; there are times when the reader must dig beneath the surface of their skimming eyes to engage with the content presented. I do not utilize “big words” to intimidate or sound intellectual, or even to seek adornment. It is with a love for the art of verbiage, the sheer desire to share something new that may be as old as your surname. I do it with hope, that if there be any unknown factor amissed in my writing inasmuch irks but compels the stagnant mind into movement. One awaiting a voice dynamic, inviting the partaker who scurries frenzied to the dictionary or set searches in submersible analysis of what husks my heart, my mind, and my soul. My language may not be perfect. My grammar may be off. Yet, all writing is my own. 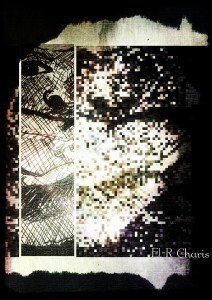 Welcome to the world of El-R Charis!